I feel like our world is obsessed with discovering the latest “hack” to make our lives as efficient as possible. I always receive emails about helpful hacks that will save me time, make me happier, make my workouts better, etc, etc. And of course eating hacks seem to be especially popular. How can we make our meals more convenient, more nutritious, more enjoyable so that we have more time leftover to do the things that we really love? The startup world is overrun with companies that are determined to hack your way to a better meal by delivering your food faster or doing the grocery shopping for you. Good food can be yours with just a click of an app. bottles of ample ready to go. 400 calories, natural ingredients, 26% protein, 25% carbs, 49% healthy fat. Ample is a new food startup that takes food hacking to the extreme. It disrupts our whole approach to eating by reducing the activity to only its core essential – delivering sustenance to the body. You don’t have to deal with the nuisance of thinking about what to eat, physically going out to get your food, waiting for a meal to get to you or doing any sort of prep whatsoever. All you do is grab an Ample meal shake bottle, fill it with some water or milk, shake vigorously to blend, and consume 400 clean calories fortified with the right mix of nutrients so that it can serve as a reliable meal replacement. And now you can get those 30 minutes back that would have been spent thinking about which salad to get at Chop’t and walking the few blocks over there. I’m clearly not the right demographic for Ample, as I live to eat and can always make time for food. Even if I know that I will have back-to-back meetings, I will go get a salad at 10 am and bring it back to the office so that I am all prepared for the day ahead. I guess some people do not think ahead like that. These are probably the same people who are so busy that they forget to eat and think eating is getting in the way of getting things done. But I was curious to see what it tasted like and how I could potentially integrate Ample part-time into my life, so I took the plunge and decided to hack my lunch with an Ample shake. 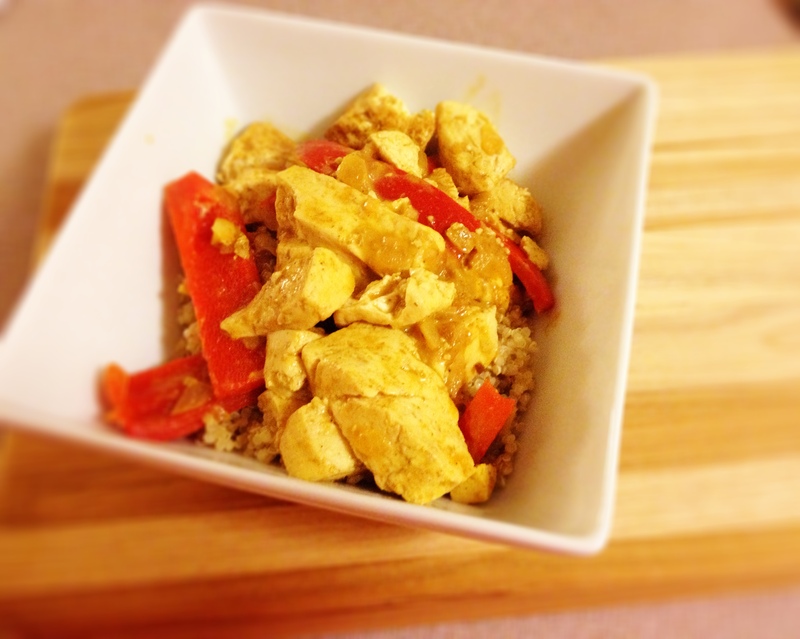 It certainly was the easiest and quickest meal I ever made. I simply poured water up toward the top of the bottle and shook it pretty hard to make sure things were well-blended. I found that even though I was thorough in my shaking, things didn’t quite blend completely, and I was left with some powdery pancake-batter like lumps floating around. Flavor-wise, it wasn’t too bad. With almond milk, the Ample shake tasted somewhat like cookie batter, which isn’t a bad frame of reference. With water, however, I found that it tasted too much like some GNC muscle shake, although without that tinny, artificial aftertaste. I was nervous that I would be hungry, but what do you know, I actually was satiated from 12 to 4 pm, and no sugar crashes or anything in between. I honestly think that it would be worthwhile to have emergency bottles of Ample on standby for those days when things are crazy and finding time to step out for lunch is annoying. Because sometimes a Kind Bar doesn’t cut it. But an Ample shake definitely will. Do you ever feel that when winter hits, your body goes into hibernation mode, and you start eating everything in sight, even though in modern day times you no longer have to build up layers of fat to survive the bitter winters, just like our caveman ancestors once did? If this isn’t a problem you struggle with, lucky you. Unfortunately, my vestigial winter survival instincts were kicking in high gear, and I was snacking like a mad woman. 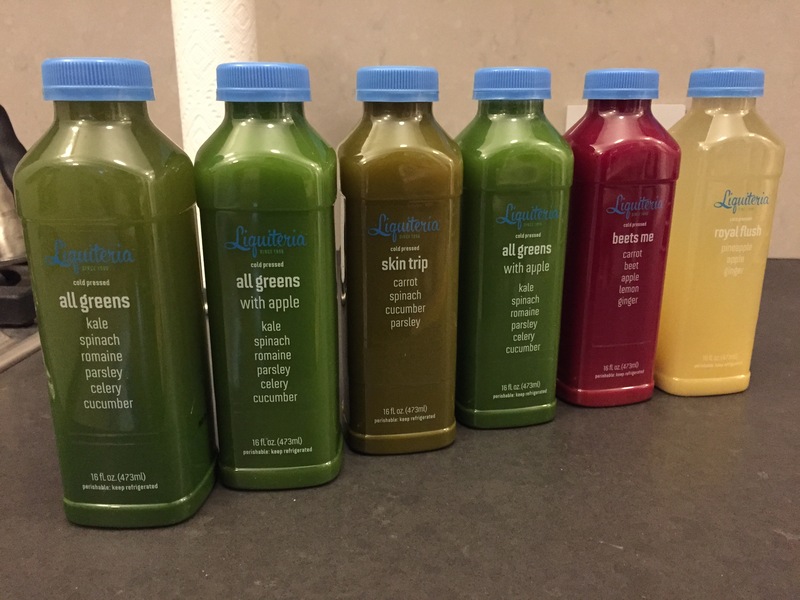 I felt like a cleanse was in order to reverse some of the damage, so when Liquiteria offered its Level 1 Explore and Nourish cleanse on Gilt City, I bought one asap. 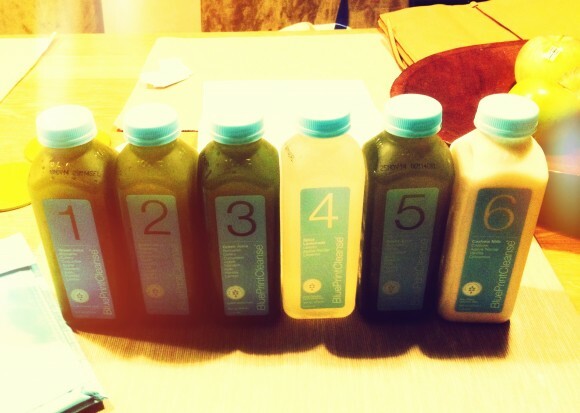 The Level 1 cleanse is designed for beginners and consists of 6 juices. I feel like I’m more of an intermediate cleanser, but the Level 2 cleanse had two All Greens juices in it, whereas the Level 1 only had one, and that was honestly the deciding factor. Also, level 1 cleanses tend to showcase overly fruity and sweet juices to appeal to beginners, but this one was actually light on the fruit basket. All Greens – this is probably one of the more challenging juices on the cleanse. I remember hating it when I was on Juice, Eat & Repeat. It basically tastes like sweet liquid grass and cucumber. Surprisingly I couldn’t really taste the parsley in here, but the cucumber was front and center. All Greens with Apple – this tastes like apple juice with some celery and parsley, which is awesome, considering you had to drink liquid cucumber right before it. Even though it has apple in it, it isn’t overly sweet and is one of the better sweet green juices that are out there. Skin Trip – this is the worst juice out of the bunch. It looks like toilet water and tastes like it too. To be fair, it actually tastes like carrot juice, but you eat with your eyes, not your stomach, and I couldn’t get over the sketchy dark brown color. Because it’s so awful, it usually takes me 45 minutes to drink it, whereas I can drink an All Greens with Apple in like 5. It also feels a bit more full bodied than the other juices, maybe it’s because of all the earthy root vegetables like carrot and beet in there. Beets Me – pretty self explanatory, it’s a sweet beet juice with a lot of ginger. I have to warn you, sometimes the ginger is intense, and it hurts if you drink it too quickly because all these gingery fumes get caught in your sinuses. Royal Flush – the last juice of the day is this pineapple apple juice with again, lots of ginger. 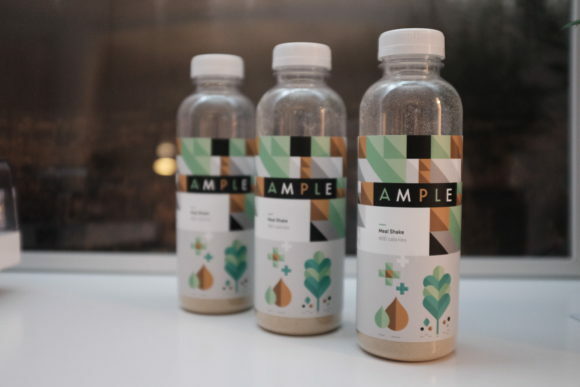 Obviously this juice is very sweet and pleasant, but I was hoping for something more comforting and substantial, like the cashew nut milk on the BluePrint cleanse. Oh well, at least it’s not a Skin Trip or All Greens. Day 1 – Started out with the All Greens juice at 8:30 am. I was dreading this juice, but it wasn’t as bad as I remembered. I was too distracted by work to realize how hungry I was, and at 12 I quickly finished off my bottle of the All Greens with Apple. I was really hungry throughout the day–I guess my stomach stretched in the winter or something–but I managed to hold out until 3:45 for the 3rd juice, the Skin Trip. Drinking the Skin Trip was by far the most traumatic part of the cleanse, it was horrible. At around the third juice my trips to the bathroom became much more frequent. And my productivity sort of shut down at 4 pm. In addition to the constant hunger, I had a light headache throughout the day, probably because I didn’t have my daily cup of caffeinated tea. After the horrible Skin Trip, the All Greens with Apple tasted especially heavenly and I finished it in 5 minutes. When I came home from work, I finished the Beets Me juice, which was extra gingery. I couldn’t drink it too quickly because of the kick from the ginger. 2 hours later I had the Royal Flush and went to sleep soon after. Day 2 – Wow, I had the best sleep ever last night. I felt so well rested. This is the best part of cleansing, the quality of your sleep definitely improves. I was surprisingly less hungry today than yesterday. Maybe my winter stomach was shrinking back to its normal state. My slight caffeine withdrawal headache also went away. Normally on the second day of the cleanse my mind gets a little foggy and I get fatigued very easily. I did almost pass out in a group meeting but my mind stayed pretty sharp in the early part of the day. After 3 pm I was starting to struggle and became very uncoordinated, and at the market, I had such a hard time getting a bunch of kale into a plastic bag. 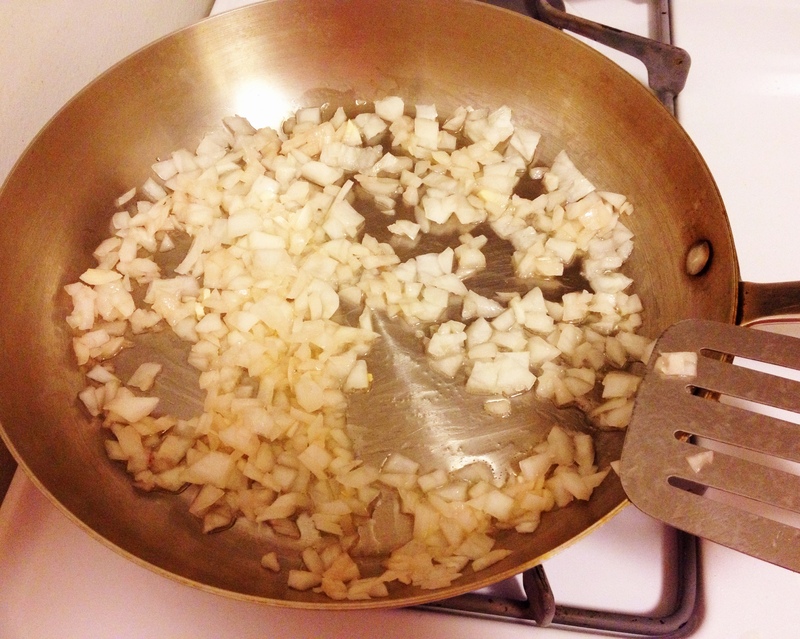 I also noticed that this cleanse really gets the digestion moving, like really moving. That’s something I didn’t experience on other cleanses. The worst drink of the day was still The Skin Trip, although I’m beginning to feel it’s the reason why my digestion has improved…so I won’t write it off completely. 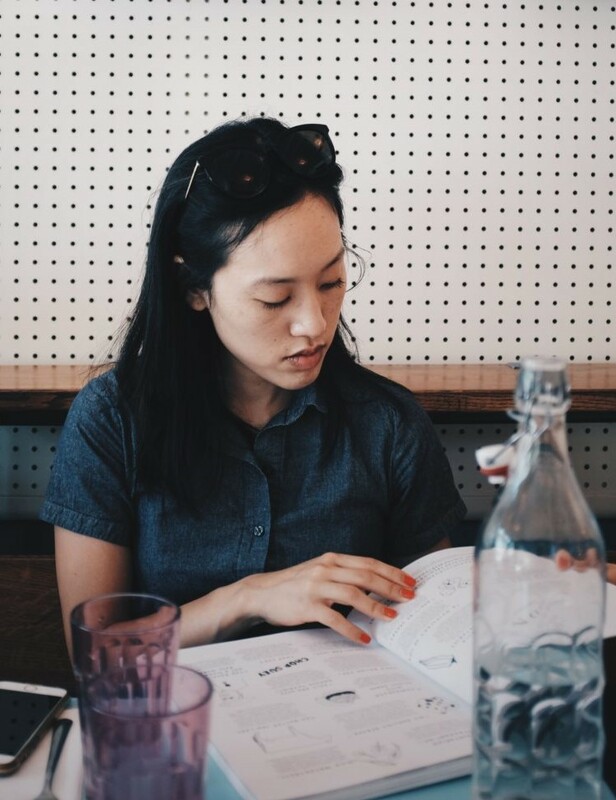 It’s a little TMI, but it felt liberating knowing things were moving out of my gut. After a particularly indulgent summer, as well as a weekend of eating Momofuku pork buns and downing a pint of Oktoberfest beer, I thought it was the perfect time to give my body a break and go on a juice cleanse. My last cleanse was Liquiteria’s Juice, Eat and Repeat, but this time I decided to go with BluePrint, my favorite cleanse program. 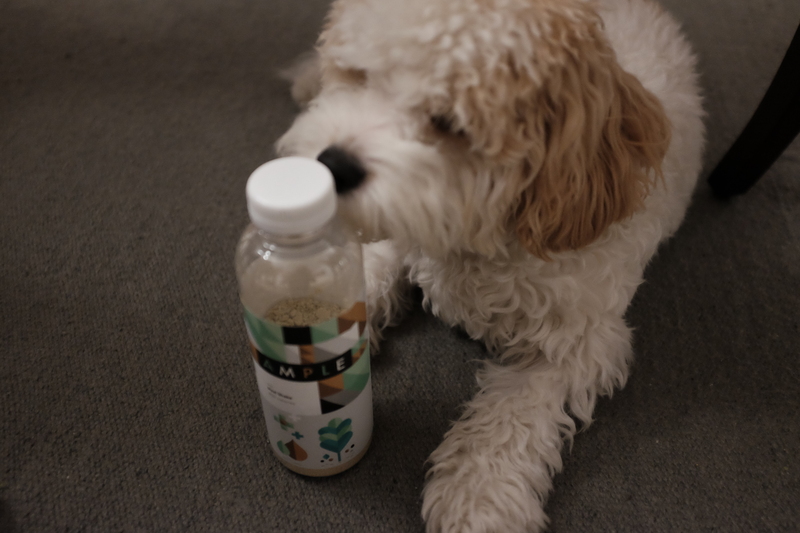 I’m a big fan for the following reasons: it’s extremely easy to follow (the bottles are numbered by the order you should drink them), the green juice is very accessible (less liquid grass, more delicious apple-celery drink), and the cashew milk is a dream (sometimes I buy a bottle at Whole Foods for non-cleanse reasons, it’s that good). I had a Gilt City voucher on retainer for moments like this, and I purposely timed the delivery to happen right after the Oktoberfest festivities ended so that I was all set to go on Monday. People’s reactions to my going on a juice cleanse range are pretty interesting, because it’s always a very strong and negative reaction. Usually they will go off on how they would never do a juice cleanse, because juicing strips fruits and vegetables of their fiber, and it’s so full of sugar, and why are the juices so expensive (that is true, ~$11 a bottle), so what’s the point of doing it, eat solid healthy foods in moderation, dum dum. Rarely does anyone say how they love juice cleanses and do it all the time, with the exception of the 1 or 2 friends that introduced me to it. Everyone does seem to agree that supplementing your diet with 1-2 green juices is a great way to integrate more vegetables. I personally do it because it is an effective way for me to jump start healthier eating habits. Seeing the water weight loss, however temporary, is a huge motivator, and since I worked so hard to cleanse my system, I’m a lot more conscious of what I eat in the subsequent weeks, and that helps to keep things in maintenance mode. I also think my stomach shrinks, and I end up eating less than usual, so even if I wanted to binge on a large pizza, I physically can’t. 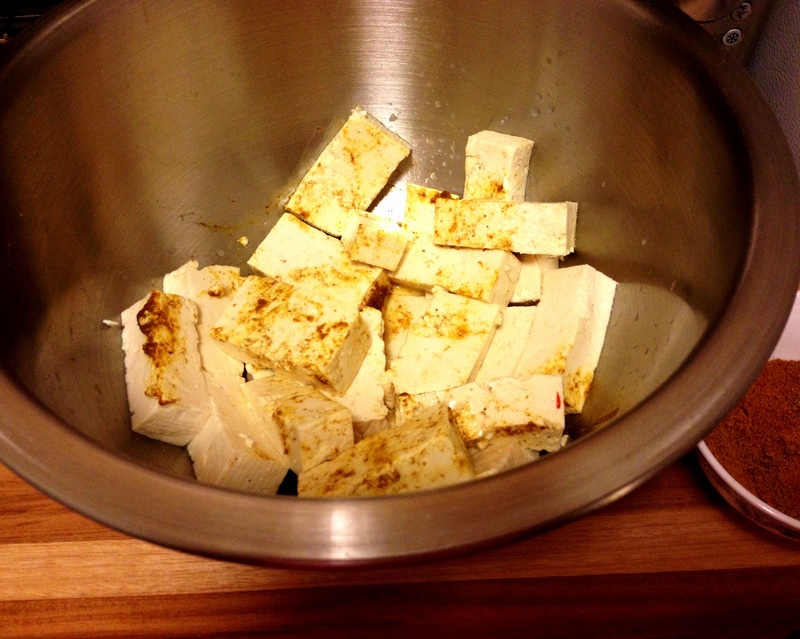 Plus, the juices taste good, so the three days of juicing, while tedious, is not unpleasant. I also avoid the cleanses that have too much fruit juices in the mix, since those are the ones with the most sugar–stick to the mostly green ones. If you want to jump on the BluePrint juice band wagon and are curious to know what 3 days of drinking stuff feels like, please proceed! Day 1 – This was the first day of my Excavation Cleanse, which consists of 4 green juices, 1 spicy lemonade, and, the best for last, the cashew milk. Day 1 of a cleanse, for some reason, is always the easiest. I think it’s because the body is still running on solid food reserves from the day prior. I did have a slight headache by Juice #3, which I think was due to caffeine withdrawal and an early Monday morning start. I luckily didn’t have too many mental juice fog brain fart moments, and I was pretty alert during all of the work calls I was on. I do have to say that at around 5 pm, my productivity came to a halt, and I kept staring blankly at my spreadsheet of numbers. I was also able to workout–I had a Physique 57 Mixed class at 8, and I was really worried that my workout would be pathetic, but I was able to do full-form push ups and all the modifications for the whole class. At 9:30, I was so grateful for that creamy, heavenly cashew milk, which went down quite easy and too quickly. I didn’t feel hungry today, although my stomach was feeling a little lonely at around 10:30 and kept making a lot of growling noises. But it held its ground and didn’t seek the company of solid foods. I fell asleep pretty instantaneously at 11:30 pm. The deep sleep is one of my favorite parts of a juice cleanse. Not sure if it’s because you’re calorie deprived, and it’s your body’s way of telling you that it can’t do this anymore, but the kind of sleep you get is awesome. Day 2 – After emerging from my deep sleep, I felt super tired. I lost about a pound the next morning. I was really looking forward to my first green juice. It struck me how fatigued I was, and I felt pretty winded walking up 4 flight of steps. I didn’t have a headache today, but surprisingly I had a stomachache in the afternoon. I’m not quite sure what caused it, but it didn’t last for long. I was also extremely cold. Each time I had a juice, I had to chase it with hot water so that I didn’t feel so miserable. I have bad circulation to begin with, so that probably didn’t help with the temperature issues. I definitely wasn’t as mentally sharp as I was yesterday, I kept thinking the next day was Thursday when it wasn’t, and I would say something but type something else on the computer. I guess these are the signs of your body detoxing and going into withdrawal from not having all those empty calories and caffeine? I skipped my workout in the evening and just sat in front of the TV and watched The Voice. After the cashew milk, I again went to sleep as soon as my head hit the pillow. Day 3 – Woke up, lost another pound. This day was a painful one, mostly because I scheduled an Advanced Physique class at 7 am. I was curious to see what my limits were workout wise. I almost didn’t make it through the push-ups, and I just didn’t even bother trying to lift my hips AND legs during the side planks. The 3 pound weights also felt very heavy, very fast, but I managed to work through it. I was also super hungry today. Usually I time my juices about 2 hours apart, but today I drank based on when my stomach grumbled. Which was earlier than the 2 hour window. I was in less of a mental fog than yesterday, which was good, but not anywhere near pre-cleanse levels. I was also really, really cold again. I was so looking forward to the protein goodness of the cashew milk, that I debated whether I should skip Juice #5 and dive immediately into the nut milk. I decided to stick to the schedule and was pretty relieved that this was the last day. Post Cleanse Day – I lost another pound, bringing the total to 3 pounds. What these tricky juice cleanse programs don’t tell you is that the cleanse is longer than 3 days. Really, you’re supposed to prep 3 days beforehand, and gently break it 3 days afterwards. So really it’s like a 9 day affair, which is way too long for me. I like a quick and fast burn. My workout in the morning was still horrible because I didn’t eat any post-cleanse foods yet. I tried my best to break the fast via BluePrint’s instructions, which entailed eating only fruits and leafy vegetables the first day. I was pretty good up until lunch, but then Ruoxi wanted to eat pork shoulder and sausage and red wine for dinner, so clearly this derailed my plans. There’s a reason why you have to ease into solid foods, because my stomach started hurting when I ate the pork, and I couldn’t eat that much. But I really, really wanted to. This is how much I like food. Even when I’m in pain or have food poisoning, I want to try everything, and I get disappointed when I can’t. Now that I’ve totally broken the cleanse, I’m looking forward to better workouts (my workout on Friday was so much more effective) and mental clarity and real meals in moderation! 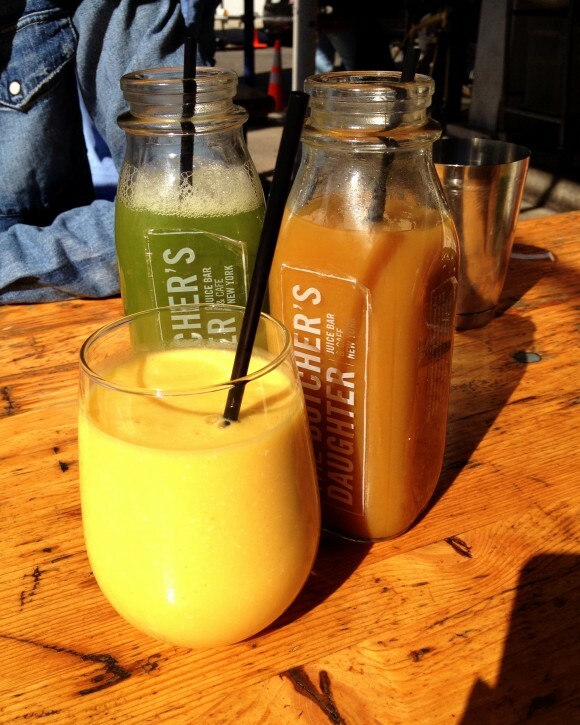 When you walk up to The Butcher’s Daughter, you’ll notice a bunch of lovely ladies sitting at the tables up front, taking a lot of brunch selfies and drinking the requisite pretty girl drink of green juice. Clearly they are here to stick to their juice cleanse and not for the food, because the food here is honestly terrible. Someone needs to let Dad back into the kitchen, because the butcher’s daughter is making a mess of things in the back of the house. 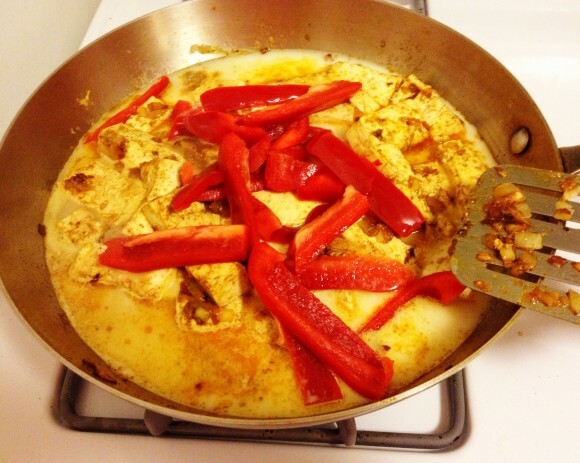 I hate to say it, but the food here represents the worst of vegetarian cooking. You know those nightmares you have where you order a mock “meat” sausage, and it ends up tasting like dried dog biscuit? Those nightmares come vividly to life at The Butcher’s Daughter. An order of the Full English Breakfast consisted of eggs, breakfast “sausage”, beans, tomatoes and mushrooms, and the sausage looked like something out of my dog’s Pup-Peroni Mix Stix package. It tasted like dried dirt and fennel, in case the awfulness did not come across. Again, I get that sometimes vegetarians miss the flavor of meat and want to eat something reminiscent of it, but the mock meat here would only serve to quickly remind them why they converted in the first place. The most edible part of the breakfast platter was the beans, but even so, I’ve had much better beans elsewhere. My smashed avocado eggs benedict was similarly inedible. There didn’t appear to be any seasoning at all in these sad, pallid poached eggs, not even a pinch of salt. The avocados were also extremely plain and bare. It didn’t help that everything was piled on top of the most unappetizing slice of dry, cardboard-like wheat bread ever. Supposedly there were curry, lime and mustard seed in the avocados, but I didn’t taste them at all. We had to apply liberal amounts of hot sauce and salt to get these things to taste somewhat better, but at the end, I gave up and didn’t even bother finishing the other poached egg. And don’t get me started on the “hollandaise” sauce. This non-dairy version had a strange texture and a flavor that was nowhere near the creaminess or the brightness of the regular version. I was very appalled and disappointed by the whole thing. 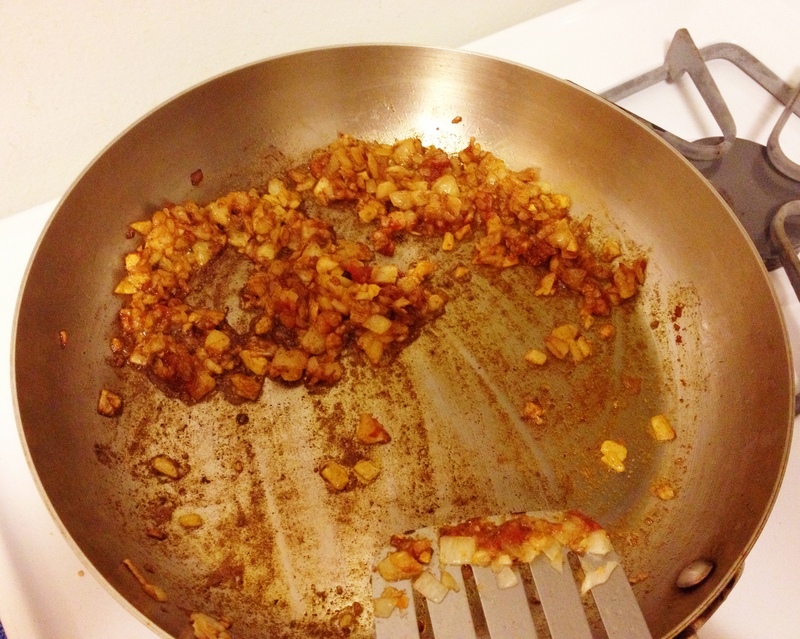 I did eat my pan-fried potatoes. They weren’t that great, and they lacked that crunchy, starchy coating that the best hash browns and potatoes usually possess, but these were desperate times, and I was so grateful to eat them. It wasn’t all bad at The Butcher’s Daughter, I guess. The heritage juices are legitimately tasty–I loved the Goddess of Green juice, one of the best green juices that I’ve had in the city, but at $9 it’s a little steep. The Honey Bee was also sweet and refreshing, although probably a little too sweet for my taste. I didn’t like the smoothie of the day, which was a mango lassi that used coconut milk instead of yogurt, because all I tasted was shredded, frozen coconut flakes and zero mango. It was yellowish-orange though, I have to give them credit for replicating the appearance, I suppose. I’m the type of girl who likes to eat, and I usually end up finishing anything that’s on my plate, so the fact that I left a whole egg untouched is a pretty big sign of how bad the food here was. Afterwards, we walked to the Hester Street Fair and ate some pork sandwiches from Arrogant Swine to wipe out the horrible memories from The Butcher’s Daughter. 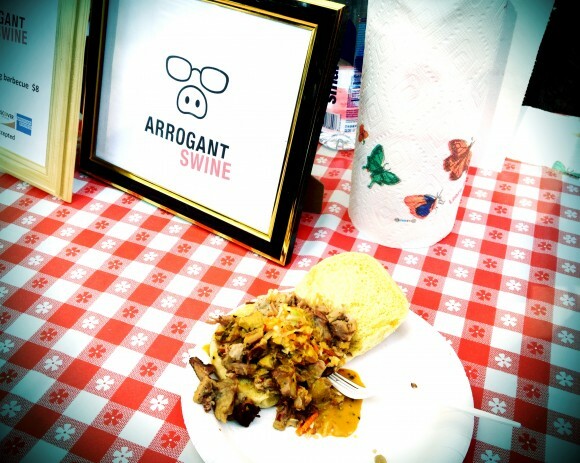 thank god for the pork sandwich at arrogant swine. 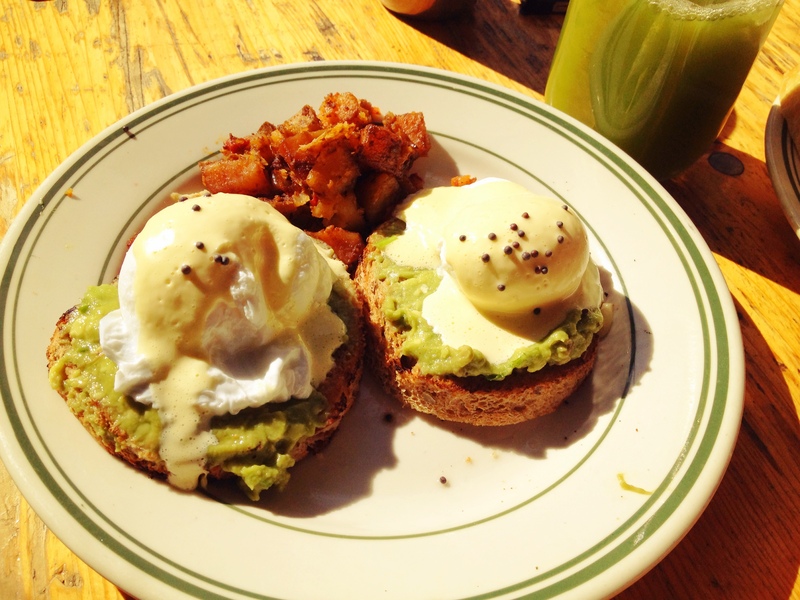 I kind of get why the pretty fashionistas line up here for brunch every weekend–bad food is an extremely effective way of sticking to a dainty cleanse. 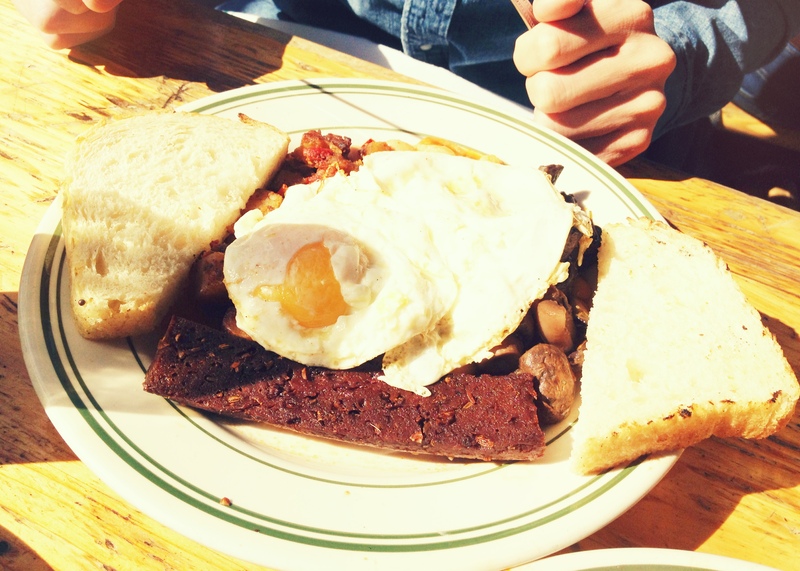 Maybe “eating” at The Butcher’s Daughter will be my post holiday New Year’s clean eating resolution–nothing like recoiling from fake egg sauce to whip you back into cleansing shape.